The trouble with wood is its shifty character. Unlike man-made boards and plywood, it is not of consistent character. This is both the source of natural wood’s charm and its flaw. Seemingly perfect pieces of wood will twist, cup and warp without warning; once distorted, the offending piece will never straighten and like most twisted characters will continue to defy orderliness until forcibly restrained, pared to size or drastically reduced, often to dimensions that render it useless. Yet there is nothing to beat the beauty, the form and feel of natural wood. All fine carpentry therefore must ultimately come face to face with the uncertainties of wood. Natural wood, as many an expert has pointed out, is a bundle of straw-like fibres of different densities, strength, colour and so on. Like straws they are open on ends that have been cut perpendicular to the length of the wood. These end sections called end grain, are prone to absorbing and releasing moisture depending on ambient humidity. The trouble is that wood, like most humans, is inconsistent in its form and character; life’s vicissitudes, trauma, external events, weather, disease and stretches of good health determines its ultimate form, which results in wide variations in its growth during life and which is preserved in that state in death. When wood is harvested and sliced into sections, its life history is exposed in the form of growth rings and grain; somewhere the grain is darker and denser, somewhere lighter and more fragile. All types of wood have grain of one sort or another; woods like Teak and Sheesham have dramatic grain while others have more subtle, often unnoticeable ones. But grain is present in all wood and an expert can identify wood by its grain and colour. In India, most stretches of forest have long been cut down – the greatest damage being done by the growth of the railways in the second half of the Nineteenth century when vast swathes of woodland were mowed down to provide wood for railway sleepers, carriages and so on. Then came hordes of private loggers to satisfy the demand for Indian Teak, Mahogany and so on. Today, many parts of India stand out red, scarred and treeless. I have seen the tragic retreat of virgin forests in the North Eastern parts of India during the Eighties and Nineties. Today, very little is left. Not surprisingly, the Indian government has enacted some pretty stringent laws to control and diminish logging. It tries as much as possible to regulate logging of old trees and does much of it by itself through state controlled forestry departments. Despite some amount of corruption, this system has largely halted the rapacious destruction of forests. Indian forests yield a wide variety of wood but by far the most popular species is the famous CP (Central Province) Teak, which even today is sourced from the central parts of the country, mainly Madhya Pradesh. This Teak is also sometimes called Nagpur Teak. Its scientific name is Tectona grandis and all Teak around the world is of the same species even though the kind of wood pattern obtaining in different Teaks may differ. This is undoubtedly the king of Indian timber and justifiably so. But very little of it is available and prices are often prohibitive. Most wood used in India today is imported, mainly from various African countries. There is a great demand for wood in the Indian home construction industry where door and window frames as well as doors and shutters are usually made from wood and that too from Teak because of its hardiness and termite resistance. CP Teak is highly termite resistant and the choice of the rich; most others have to fall back on African Teak, of which there are various varieties. Having suffered recently in my purchases of African Teak, I have become extremely circumspect in selecting wood for fine furniture projects. In the course of my investigations I have discovered that a lot of misinformation is dispensed, much of its deliberate, in Indian timber markets and the unwary buyer needs to be aware of the pitfalls. Initially, a lot of Teak was imported from Ghana and Ivory Coast but today a lot is imported from Latin America and other African countries such as Nigeria. Ghana Teak was good with close grains and so was Ivory Coast Teak with its restrained, even grain which was good for staircase railings, door-window frames and so on. Today, a lot of Teak sold as Ivory Coast Teak is not really so. Virtually all of the imported Teak varieties are plantation grown. 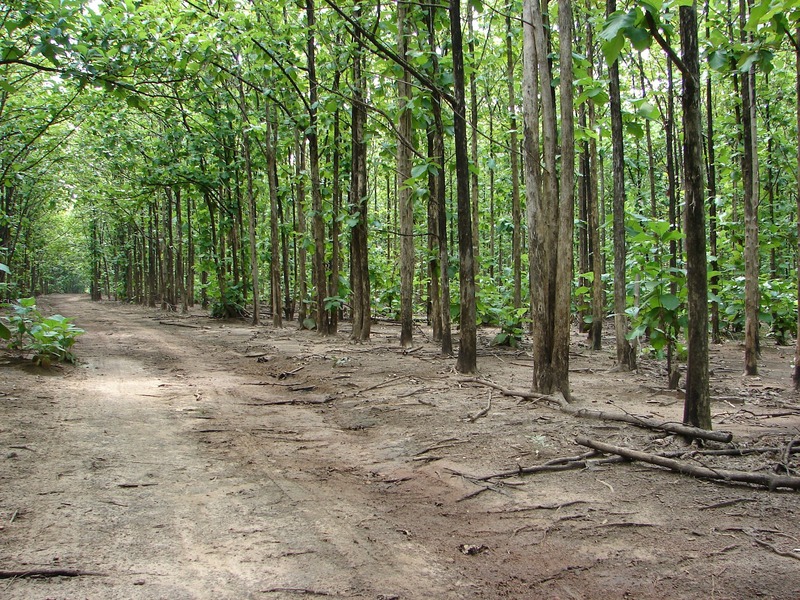 Originally Teak was native to South and South East Asia but as the British promoted the spread of Teak cultivation it spread to many Tropical lands around the world. The British favoured Teak as it was excellent material for their ships, both military and mercantile, because of its natural resistance to rot and marine organisms. Oak forests in England had dwindled because of the great surge in ship building in the 17th and 18th centuries and shipbuilders looked for alternative wood varieties. Teak quickly became the favourite – until of course the coming of steam. In India, on the other hand, Teak continues to be logged from forests. In India, the method of choice is individual logging: old trees are identified, cut and stacked in the open for gradual drying. The result is that Indian Teak, especially CP Teak, is usually old wood that has already dried sufficiently. Small lots of these dried logs are auctioned from time to time and eventually these make their way to the wood hungry markets in Indian cities. CP Teak is much drier and denser than imported Teaks; it may have prominent grain patterns such as the one in photo 1 below or close, denser patterns as in photo 2. The best buy is old CP Teak pieces that have already been cut and sized. All wood undergoes a second drying process after individual planks and batons are cut. These exposed pieces loose moisture and stabilise only after drying. This is when individual pieces can warp and bend. But older and properly dried CP Teak has a lesser tendency to misbehave. My experience with buying Teak in Delhi’s Kotla Mubarakpur timber market has made me a cautious man. A few months ago, during the peak of summer, I was pottering around looking for Teak to make an enclosed bookcase. I came to a shop which had massive blocks of Teak wood; they said it was mostly from Ivory Coast. I bought a four and a half feet long by six inch by five inch block of wood, paid about Rs 2600 for it and had it sawn into 1 ¼ inch thick planks. The grains were prominent and lovely but the wood had a rough, oily texture. I took them back home, re-cut some of them and glued them into 10 inch wide boards.There were a lot of wormholes but I could fix those. After a couple of weeks I discovered that they had bowed and twisted to some degree; the bowing was acceptable but the twist had to be planed out. This involved more elbow grease than I was prepared for and in all spent several hours spread over several days to straighten them somewhat. Then I surface planed and sanded them; yet I could not get them to become really smooth. The surface also felt a little wet and oily. It was disappointing. The problem I later learnt was with the wood. What is sold as Ivory Coast Teak is often not so – a lot of Teak is apparently being imported from Latin American plantations in Bolivia, Ecuador and Peru as well as younger plantations in Nigeria, Sudan and a few other African countries. 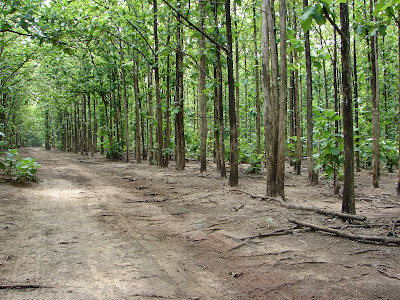 These plantation trees are harvested early, cut into logs and shipped without any kind of drying. Much of the wood destined for North Indian markets is offloaded at Kandla port and makes its way to timber depots as in Delhi’s Nangloi area where it is immediately cut into square sections and shipped to dealers. These logs ought to be kiln dried but almost always are not. The timber sent out is wet and will take months to dry; the insides take even longer to loose moisture and after been sawn undergo another round of drying and possible warping. Kiln dried lumber is usually only made available to furniture and woodworking factories in bulk. The small retailers almost never stock this. Thus the DIY woodworker has to be extremely careful in buying wood, especially expensive Teak. The best choice as mentioned earlier is to go for old, re-sawn pieces of CP Teak even though this could be expensive: between Rs 2400 and 3,000 a cubic foot. Whereas, Ivory Coast Teak would not be more than 1,800 a cubic foot and other imported Teak as little as Rs 1,100 to 1,200 a cubic foot. Burma Teak is even more expensive and could cost upwrads of Rs 3,000 a cubic foot. I recently purchased some of it for making the frames for cabinet doors. The grain is less prominent, at least before sanding and staining, while the wood is distinctly heavier and seems much more stable. I have discovered that buying cut pieces from smaller shops tucked into the bylanes of Kotla is a much better option than buying large pieces and then getting them sawn to size. These pieces are remarkably stable and therefore more economical for hobby woodworkers and fine furniture makers. But selecting individual pieces and checking them is a time consuming affair. Nevertheless, I would opine that scrutiny of wood is as important as the selection of human companions; a bad choice can be the cause of everlasting regret. More info here than I got by calling up half a dozen friends. Only one quibble nothing can restraint wood that wants to move. Glue joints distort, nails pop out, braces tear up. I fact dry dowels of wood are inserted into holes in large blocks of stone and then water is applied and in a couple of days stone cracks along the line where wood dowells were inserted into rock. Thanks Vinay, appreciate your comments (and Kittu's, of course). As for Sheesham, I have six or seven eight feet long planks drying in my workshop. Plan to get more from Hissar where a friend claims they get good quality Nepali Sheesham. Its an excellent wood, a bit difficult to work but favoured by exporters of traditional furniture based in the Marwar area of Rajasthan (JhunJhunu etc.). I have alas not heard of any online seller of wood in India. Let me know if you find one. In a short span Im seeing that with just a handful of woodworkers we are getting so much valuable information. Hi , i have had no experience with wood working. But its always been my dream to build an electric guitar from scratch. Can you point me in the right direction, wrt a book i can use to learn about sanding, routing, and choosing wood? also, i need to buy a router, and a sander. can you recommend, something that would do, within a minimalistic budget? Ankit, apologies for the delayed reply - it slipped my mind. Regarding guitars I suggest you try the Internet; there is a lot of stuff on it there. As for a router, take a look at the Black and Decker one bought by Vinay Oommen or at the Skill router available at any Bosch retailer. As for a sander, I went for a random orbital sander the first time I bought one. The one by Bosch (5 inches diametre) costs about Rs 5,000 or so. Check it out. And best of luck with that guitar! Awesome post.. Unique information made available. Thanks. Depends on your taste but by itself Teak would be a good choice for doors. Hi ur article very good. We got wood 'Ivory Coast'.. Made door chokhat in month of Feb Mar delhi... It is twisted as is the doors and windows chokhat. This wood was also called sagwan.. Is it not wrong? Even Ivory Coast Teak should not twist and bend if has been properly dried. Difficult to say whether you were actually sold that wood or something else. I just wanna ask, if i go in market for CP teak., what are the differences one can note btw cp and other african teaks coz they give u wood with lots of mix with ivory teak. Thats what i have listened about. Kindly give some information regarding that..
Prateek, you have posed a difficult question. Often it is not easy to tell - but some signs of CP Teak: Generally dry, much more dense than African Teaks, colour is different (cannot really explain this), is usually less oily and its figure is different from African Teaks. Don't know about Champ and Holak but Ivory Coast Teak can be pretty good for door and window construction. CP Teak is definitely ahead of other varieties. But would you put Ivory Coast / Ghana teak as the second level wood, or would you put South African as second choice ? If one can find a kiln which is perpared to kiln-dry the few sleepers I need for my furniture, would you recccomend kiln-drying after sawing into planks or for the whole sleeper ? I haven't come across South African Teak so wouldn't be able to tell. Common sense suggests kiln drying thick planks separated by sticks might be better as all of it would dry more evenly. But I am no expert in this. I just purchased CP teak for constructing doors and windows for my home from a shopkeeper in my town . He provided me 8foot *8 inches wooden blocks . The wood has very good grains . But when we began cutting them in required sizes the wood had holes from inside ( khokhli in hindi ). All the pieces after cutting had one hole . We had cut only 3 blocks and all 3 of them had holes ( they say its gaanth and it sometimes happen) . We have around 20 blocks remaining . The shopkeeper is giving us a choice that we can leave the rest blocks if we don't want to buy them but we have to take the blocks which were cut . What should we do . Please guide me . PS i am pretty sure that the wood is CP wood mainly from Nagpur as is told by the shopkeeper. Knot holes and insect ravages areas inside the wood is an inherent problem especially with natural forest wood. Encountering them is a matter of luck. Whether you should keep them or return them is a tricky question as it is not certain whether the whole lot is bad but it could be. Check your remaining pieces for large loose knots and other imperfections; if you find many return the lot or else take a chance with them. But remember there can be no guarantees. Best of luck. Thanks for replying so fast , i just have another query. Same shopkeeper after the knot holes problem offered another lot of 8foot*8inches size of CP teak . But after cutting two blocks of this lot the frames had bend in them . Some even had 0.75 inches bend . But they do not have knot holes . Could you please throw some light on this bending problem. Some amount of bend is natural - .75 inch or six "soonth" as they say is a lot. However, it can be rectified by proper cutting. The wood should be left to acclamatised 4-6 weeks after ripping. thank you for your help . 4 blocks of 12 inches of CP wood were cut today and luckily none had knot holes or bend. I just wanted to ask you for bathroom doors of 7 foot height is it compulsory to place a wood horizontally in between the two side frames to prevent future bending in wood. PS I am using CP wood for frames and plywood in between. 1. Some merchants have told me about CP2 teak, which according to them lies midway between Nagpur teak and Ivory in terms of quality. Is CP2 really a teak? They've quoted the same price for CP2 as you've mentioned for the CP teak. 2. What are the major differences between CP2 (if that's a thing) and Ivory (apart from more grains and better appearance in the CP)? Does they differ on parameters like strength, termite resistance etc? 3. If I go for the CP2 teak, the sawn pieces are thinner than what my carpenter requires for the door's construction. So a merchant told me to buy the sleeper of CP2 and get it sawn according to the size. Considering the already sawn planks being suitably dry, is that a good idea? Also, how long should I keep them for drying before using? PS: I apologize for the long read. I hope you understand my situation. 1. There is no such thing as CP2 Teak. Perhaps they mean second grade CP Teak. How can a Teak be between Nagpur and Ivory Coast teak. This is absolute nonsense. 3. Most Indian Teak is fairly well dried before it is auctioned. After ripping you should allow for 6-8 weeks of drying time. I don't know what he means by sleepers because this term refers to the pieces of wood cut specifically for railway tracks. Teak comes in the form of logs of different dimensions and can easily be ripped to the sizes that you require. If it is the second grade CP teak, is it still a better choice than Ivory Coast teak? Apart from appearance, which one would you pick in terms of strength and durability? It would depend onn thwe quality of wood. Some Teak that goes by the name of CP Teak, even if 2nd grade, can be quite bad. Check it out and see how free it is of large knots and defects before buying. Generally speaking, CP Teak is far superior to most if not all African Teaks. Sure, I'll try to discriminate the defect free wood while buying. No idea, Feroz. Didn't know Teak grows in Nagaland. Teak is indeed a tricky business these days. For my house construction I visited many timber yards in Bangalore, they confuse with terms, Burma, Border, Ghana etc .. but eventually the gullible buyer go just with the Price. These days Carpenters too are not much interested in selecting good wood for their customers, I guess they too lack knowledge in wood. I remember my grandpa saying when selecting logs carpenters used to hit the log with hand/tool and listen the sound coming out to decide whether it has any defects(hollow) in it, which would possibly waste wood. Too many young carpenters with all the array of power tools, lacking any traditional knowledge and no good wood available locally puts 'wood work' in a grey area. When I read your articles, I see the amount of effort you had to invest in collecting these details, its a fusion of old & new knowledge. Appreciate a lot Indranil sir.